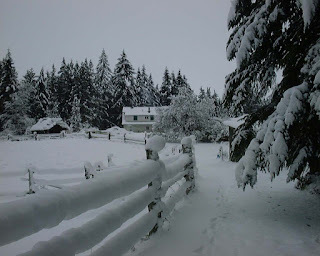 The farm after a typical winter snowfall. We live in the foothills of the Olympic Mountains in northwest Washington state. At our elevation of about 1000', we typically get a fair amount of snow between November and February. An average winter would include a lot of nights with temperatures in the 20s, some nights in the teens and often a week or so in single digits in December. 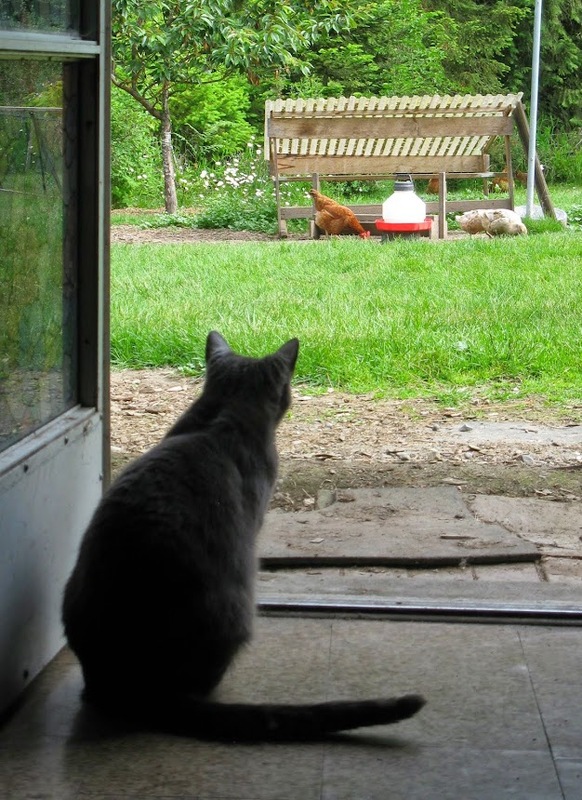 We have been raising free-range chickens here since 2007, and turkeys and ducks since 2008. We are also off the grid, so we don't use things like heat lamps in the coops. In fact, none of our coops are heated or insulated. So how do we keep our birds warm and comfortable during freezing weather? One important consideration is breed selection. Some turkeys (as well as other poultry) are more cold-hardy than others. If you live in an area with harsh winters, do try to find a breed known to be cold-hardy. It's also a good idea to talk to others in the area who have some experience raising turkeys, and get their advice. Old Tom, the patriarch of our Midget White turkey flock. 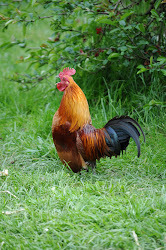 With chickens, usually a main concern is frostbitten combs. 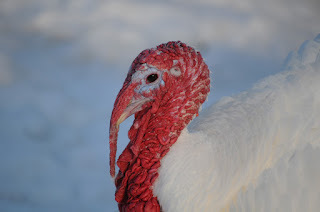 I wondered myself, with their bare heads and large wattles, about how our Midget White turkeys would manage when we had days with the temperature staying below freezing. At the time I could not find anything in books or blogs about this, so we just had to learn from experience. Turns out, the turkeys were just fine. We didn't do anything special to help prevent frostbite. However, there are a few tips I can give you that have proven consistently useful. 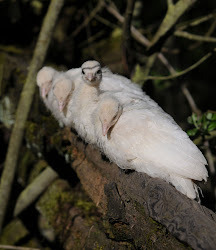 First, turkeys, when given the choice, will opt to spend the night roosting outdoors, usually in a tree. Unlike our chickens, they don't seem to mind being out in the rain or snow; the toms especially seem disinclined to get out of the weather. The first couple of years we had turkeys, we were chasing them out of the trees every night. At this point, almost all the turkeys we have were hatched on our farm, by broody hens, so they learned from their mamas to go into a coop to roost at night. This not only keeps them out of the bad weather, it also helps minimize predator problems. The important thing about turkeys roosting in a coop is to make sure the roosts are big enough. Even smallish turkeys like the Midget White have large feet. Like chickens, when turkeys roost, they settle down on their feet and their feathers keep their feet warm. 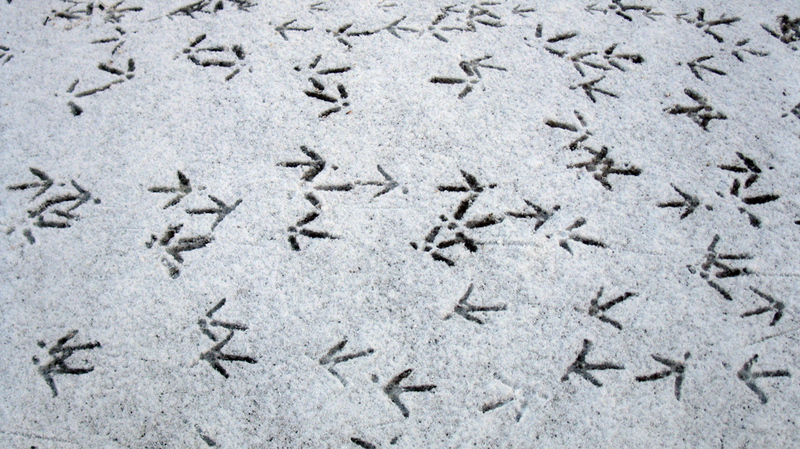 It's critical to use a roost large enough so their toes can't go all the way around it; otherwise the tips of their toes won't be covered by the feathers, so they are vulnerable to frostbite. What's worked well for us is to use cedar 2x4s for roosts. If you have another kind of heritage turkey (most of which are larger than the Midget White) you may need to try something even larger. We turn the 2x4s so the wide side is turned up. This seems to be just fine for all ages of turkeys. Our turkey roosts are about 6 feet long; depending on the size of your turkeys, if you use roosts longer than this, they may need extra support in the middle. 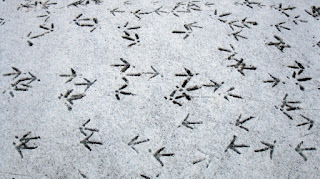 Another thing we do in cold weather is to bump up the birds' carbohydrate intake. The easiest way we've found to do this is to feed out some cracked corn an hour or two before they go into their coops for the night. This gives them a carbo boost to help regulate their body heat during the long cold winter night. getting cold, but snow and ice don't seem to bother them much. One other bit of advice I'd like to share: In the winter it's even more important to keep up with cleaning your coops out regularly. The birds are spending more time in those coops than they do outdoors when the days are short, and most of their poop is in there with them. 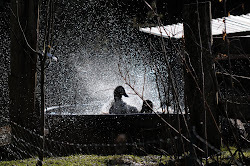 Birds are quite vulnerable to respiratory problems, so please keep those coops clean and dry. This is also a good time to make sure that there is adequate ventilation in your coops. It's easy to think that your birds will be warmer and more comfortable if you close up the windows, but air circulation is critical. I promise, it won't hurt your birds. To sum up: Select cold-hardy breeds if you live where winters are cold. Make sure your roosts are large and sturdy enough for your turkeys. Help keep them warm at night with extra carbohydrate before you tuck them in. Keep those coops clean, dry, and well-ventilated. Your turkeys –and other poultry-- will be happier and healthier. I'm always interested in hearing about your experiences, especially in different parts of the country. If you raise turkeys, let me know what you do to get them through the winter. I have 15 acres in deep South Texas close to Brownsville. I have buff ducks, bourbon red turkeys, chickens along with many more animals. We don't have freezing weather bery often but we do have high winds. Your article was very interesting. We put up a 3 sided roosting house for our turkeys. They seem to like it. It keeps them out of the wind and rain.